FAMILY BRACES • Can't you just fix my front teeth? Can’t you just fix my front teeth? It isn’t at all that uncommon for first-time patients to walk into the office of an orthodontist with expectations that the dental professionals there will simply be able to fix their six front teeth (the teeth that most people see when you smile) with lightning-like speed and efficiency and simply send them on their day. Unfortunately, these expectations are not at all that realistic – which is why it is so important to come in for a full (100% free and zero obligation) consultation to get a better understanding of exactly what you are up against, the factors that are negatively impacting your smile, and the best way to not only adjust and align your teeth but also to do so in a way that provides completely permanent results from here on out. You’d be surprised at the number of people that are very, very frustrated to learn that their expectations were unreasonable right out of the gate – especially those that do not see all that much wrong with their smile but just want a minor adjustment. Again, however, the underlying conditions that are causing your teeth to go out of alignment may be much more significant than you could ever expect, in the same way that the root system for the largest trees on the planet goes far deeper into the soil and far wider than the trunk and canopy system that we actually get to see above ground. 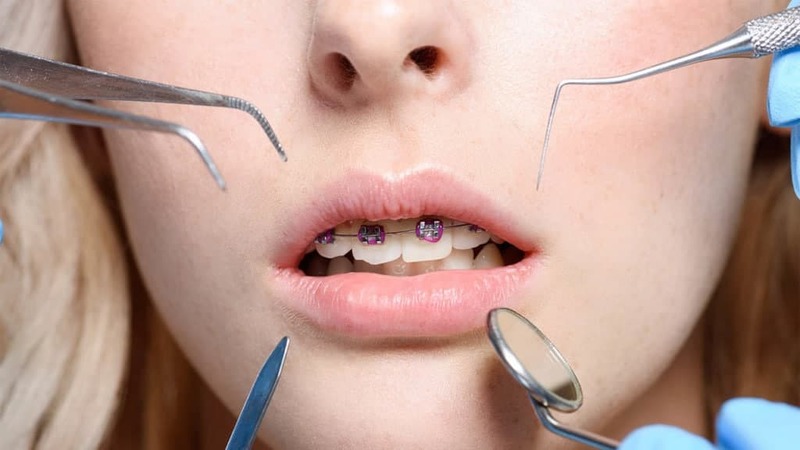 Right out of the gate, any professional orthodontist would tell you that yes, it would be possible – and relatively inexpensive – to fix just the front teeth that people see when you smile with a couple of quick adjustments and call the entire process good to go. But that doesn’t mean it would be a smart decision. As we highlighted above, once you start to move teeth from their natural position into an artificially straight position (which is exactly what we as orthodontists are doing), you have to adjust for this new position, you have to reinforce these new positions, and you have to realign the entire bite or you’re going to run into some very serious problems later down the line. Just straightening out your front teeth without addressing these other conditions can create an overbite situation and underbite situation, or a crossbite situation – all of which have the potential to damage and destroy your teeth. Your gums are going to hurt, your jaw is going to ache, and you are going to deal with more headaches than you ever could have expected or anticipated possible. When your orthodontist recommends a more complete overhaul of your smile, not only straightening your front teeth but realigning your bite and readjusting all of the teeth in your mouth, they aren’t just recommending the most expensive and the most time intensive work that can be done but are instead providing you with a permanent solution that leaves you with a perfect smile from here on out rather than one that may look okay at first but will inevitably rack, twist, and cause a whole lot of pain along the way. Sadly, a lot of general dentists will recommend these “quick fixes” more often than not simply because they lack the in-depth orthodontic training to really understand why they aren’t such a good idea. “Six month smile” solutions are all the rage right now, and promise to completely adjust and realign your teeth after six months have passed – but make absolutely ZERO promises about whether or not your bite will be aligned, whether or not you’ll deal with horrible headaches and migraines, and whether or not your teeth will become damaged along the way. Products like over-the-counter alternatives to Invisalign, for example, are included in this “DIY fix a smile” marketing craze that is so popular today. Invisalign braces can work wonders when they are properly fitted and prescribed by a legitimate orthodontist, but when nonexperts start to tinker with your smile – or when you start to tinker with your smile all on your own – things can really start to run right off of the rails. Thankfully, when you choose the right orthodontist to work on your smile, you don’t have to worry about any of those nightmare situations coming true. Instead, you’ll be able to depend on their rock solid results that they are capable of producing, giving you the kind of permanent fix you’ve been dreaming about that results not only your smile issues but also guarantees that your bite is perfectly aligned and that your jaw is set the way it should be. Contact us today for a 100% free and zero obligation consultation to learn a little bit more about how we can best help you and your smile!